Air or fluid actuated from 90 to 140 psi. 25% more torque (1084 lb. ft.) and higher engagement speeds (1800 RPM). The low profle, compact, Logan PTO design is suitable for workboats, fishing boats and Logan PTO pleasure craft. The Logan PTO aids in the reduction of emissions, energy, fuel costs and wear and tear on auxiliary attachments. Engagement up to 1800 RPM's with optional SoftstartTM control. Multiple optional accessory control packages to suit every model. Output: SAE B, SAE C pump mount flanges and popular Dana shaft adapters. Logan PTO is used as a separate power source for bow and stern thrusters. 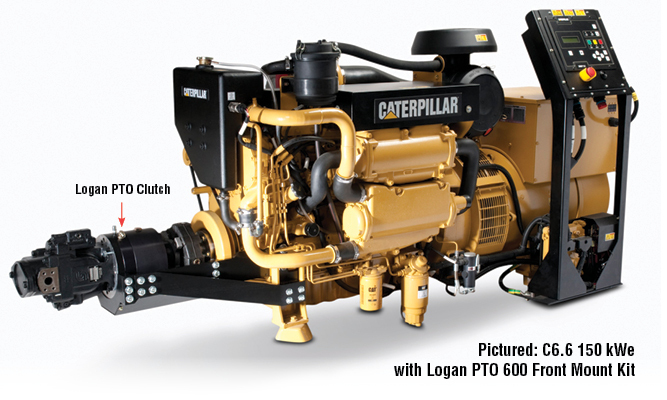 The PTO directly connects to a pump drive, which powers winches, reels, hoists, and deck pressure washers. The PTO can be coupled to an alternator to supply electric power to other power consumers on the vessel. 600 lb. ft. of continious duty torque @ 100 psi. - 140 psi. Max engagement speed is 1800 RPM. Clutch shown with cover plate removed. 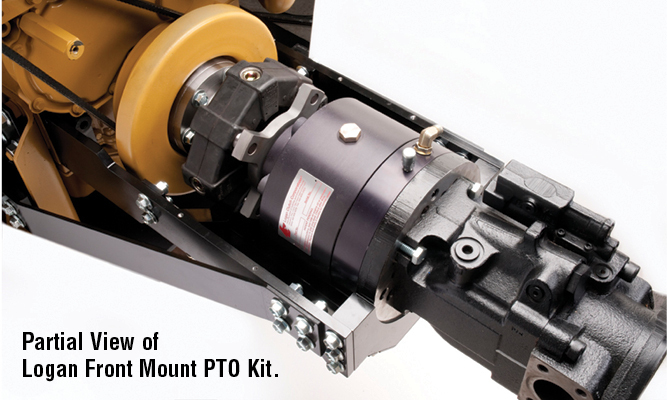 Partial view of Logan Front Mount PTO Kit.